Children’s Style Guide – Week 9 – Spring Fun! We did the “spring forward” yesterday with daylight savings! Now it is time to spring forward with fashion! It’s Monday! That means it’s time for another Taylor Joelle Children’s Style Guide. This week we have two fresh children’s children’s looks for spring put together by the designer and founder of Taylor Joelle Designs, Jenny. If you are looking for the perfect look for your kids for spring, a photo shoot, a special occasion or just because it’s Monday – you have come to the right place! We know that you’ll be inspired! Our first Easter look is for the boys. This spring look is bright and can be layered so that your son is prepared no matter what the unpredictable spring weather brings. Start the look with these Green Pants and High Top Sneakers with Zips from zara.com. 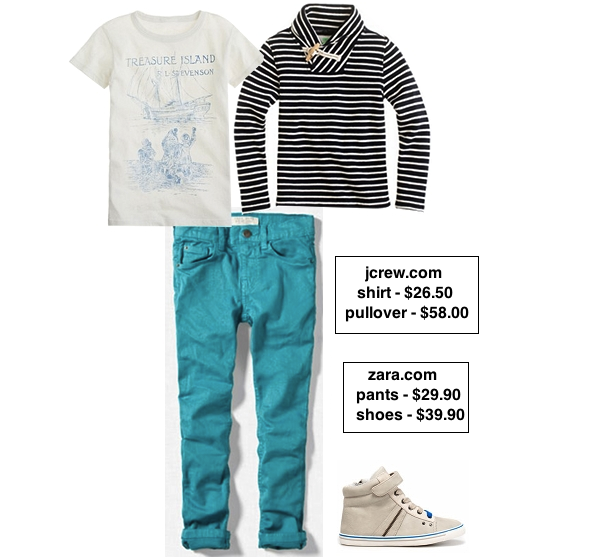 Top it off with this Fun Graphic T-shirt and Nautical Stripe Pullover from jcrew.com. The next spring look is for the baby sister of the family. Start the look with this adorable Denim Romper from gap.com. The soft spring Cardigan and Sandals can also be found at gap.com. Add the finishing touch with this adorable Felt Flowers Headband from The Pretty Owl on Etsy.com.